Monarch Air Group provides private air charter in Alberta, Canada. Our clients benefit from top-notch service, unrelenting dedication to safety, wide selection of aircraft, and years of experience in chartering private jets. To obtain a free quote, please use our online quoting tool provided below, or call toll free 1-877-281-3051. Located on the North Saskatchewan River, Edmonton is the capital of the Canadian province of Alberta and the province’s second-largest city after Calgary. It is a cultural, governmental, and educational centre. 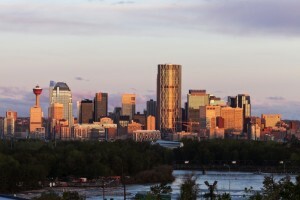 Edmonton is named the “Oil Capital of Canada” and plays a significant role in such industries as oil sands, coal mining, natural and oil gas, tourism and agriculture. Being among Canada’s advanced centers for technology development, Edmonton is a birthplace of the Northern Alberta Institute of Technology, the University of Alberta, and the National Institute for Nanotechnology. Edmonton is a modern city that has plenty of educational and cultural attractions, beautiful museums and galleries, amazing parks and gardens, fine festivals, shopping mall, entertainment and dining facilities. The most notable attractions are the Government House, the Alberta Legislative Building, the Shaw Conference Centre, the Old Strathcona Historic Area, the Rutherford House Provincial Historic Site, the Aquatics Entertainment Stage and Sea Life Caverns, the Fort Edmonton Park, the Edmonton’s Commonwealth Stadium, and the Odyssium. Edmonton is the shopping capital of Canada that has West Edmonton Mall, the largest mall in North America. It is also Canada’s Gateway to the North, and it attracts millions of visitors each year. Edmonton International Airport (YEG) and Edmonton City Centre Airport (YXD) are major airports, which provide private charter flights to business and leisure travelers around the world.